My favorite season of the year is finally here! The cooler weather, the change of the leaves and pumpkin spice EVERYTHING, I love it all! Fall is especially fun in our home because we celebrate 3 birthdays (including my own!). This year it is extra special as we get to celebrate in our first home! We have been in our new home for just 2 months but we’ve already made it our own. 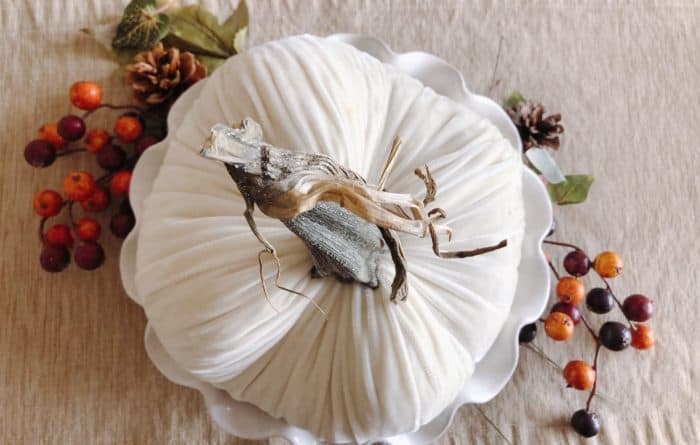 I was excited to dig into my fall decorations and take the time to decorate intentionally this year. I decided to focus on the first floor of our house because it is the most un-packed. We already re-carpeted and painted the living room and the kitchen has been unpacked. These are the two rooms that we spend most of our time in and the spaces that our guests will enjoy so I wanted to make them feel special. 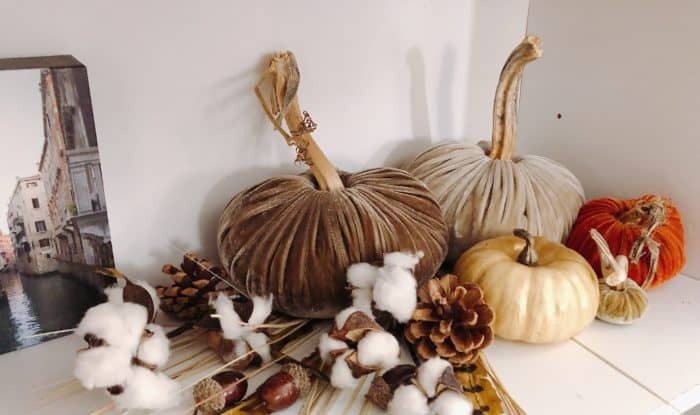 I have a growing collection of gorgeous velvet pumpkins from LoveFeast Shop (Disclosure: LoveFeast Shop is a client of mine, but I do have a slight addiction to these beauties!). 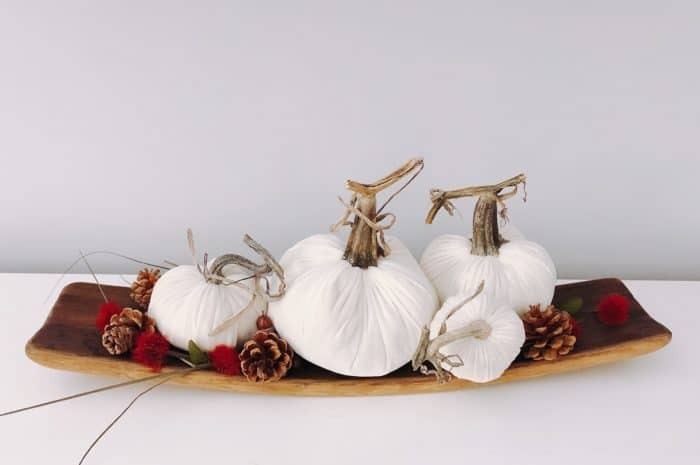 These gorgeous pumpkins are the focus of my fall decorating and I love to scatter them throughout my home. 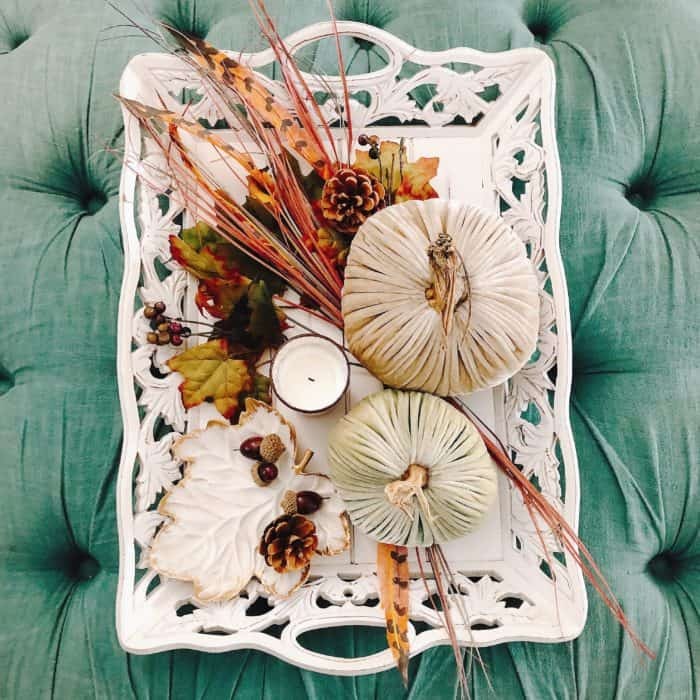 I’ve found inexpensive, yet beautiful fall decor items from several sources this year, Hobby Lobby, Michaels, HomeGoods and Target (even the Dollar Spot my friends!). I’ve also collected things from around our house to fill in the empty spaces. Once space that I had loved decorating was our kitchen. 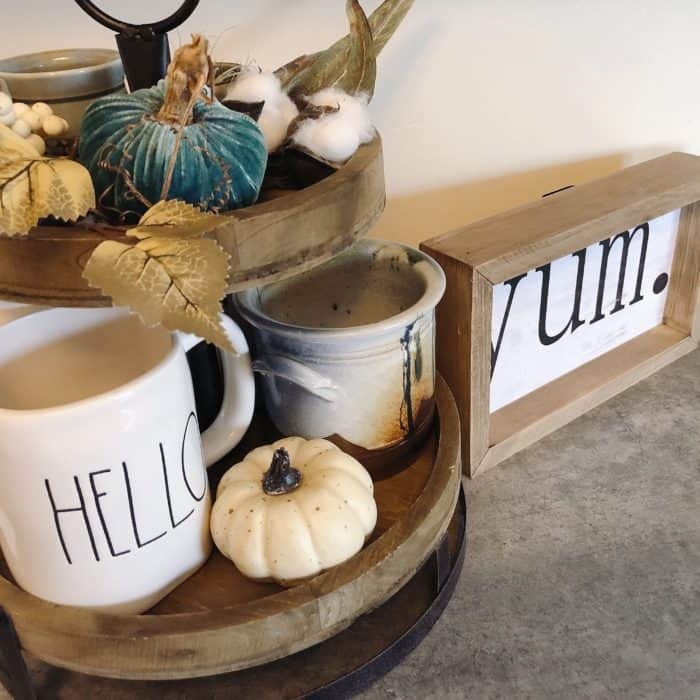 I picked up this cute 3 tier shelf from Hobby Lobby then I layered in some faux florals, a sweet velvet pumpkin, mugs and some of our favorite pottery from Ireland. And I’m in love with my little “YUM” sign! One of my favorite finds before moving was this beautiful teal ottoman. I’ve wanted one just like this for years and one day I stumbled across one for sale on Facebook Marketplace… friends… I paid $20 for it. I was thrilled. It’s used and not perfect but that’s what I prefer, lived in furniture always makes a house feel a little more cozy. I kept our table simple for fall. 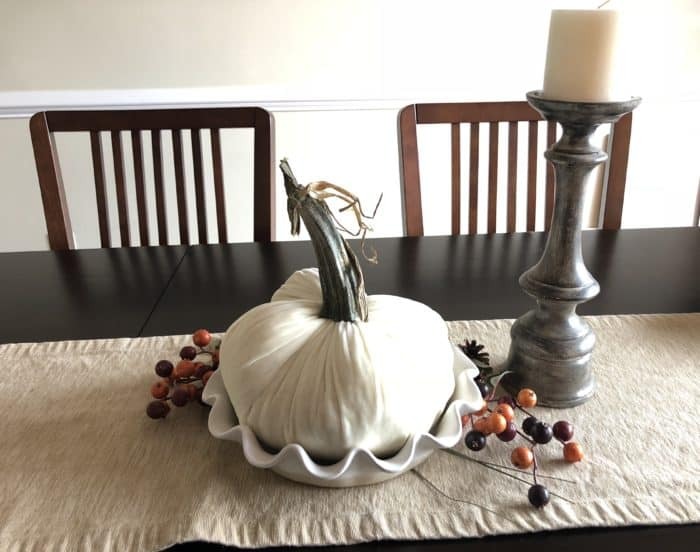 I created a simple centerpiece using a table runner that we’ve had for years, a pie plate from Williams Sonoma, an 8″ Ivory Velvet Pumpkin from LoveFeast Shop and a candle stick from Hobby Lobby. We use our table for all of our meals so I needed something that could be easily moved, it’s easy to slide the runner and centerpiece out of the way when we have a meal. 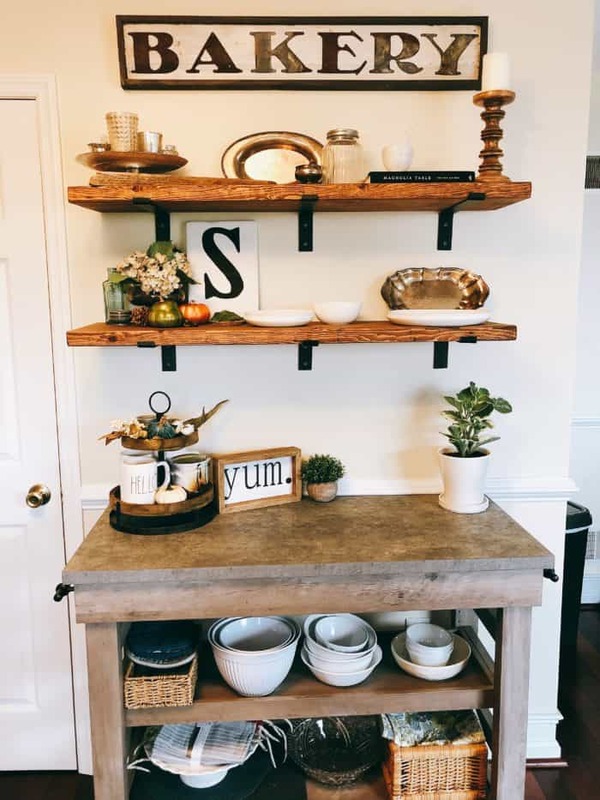 I’m loving being in our new home and I’ll be sharing some of our house projects as we finish them. So far we have replaced the carpet in the living room, stairs and hallway and painted the living room. It was a huge improvement, I can’t wait to show you! Thanks for stopping by, if it’s your first time stopping by I would love for you to subscribe so you don’t miss any new posts! Those pumpkins are so very pretty. Thanks for sharing your lovely photos. My favorite is the one shot from above of the pumpkins on your teal ottoman.